Parents of babies who have started eating solids are often at cross-roads of what food options to offer their babies, the challenges are more for nutrition-conscious parents who want to offer the best they can afford to their babies, as well as for parents of picky eaters who need to keep trying new meals to see that which their baby would love. Home made baby foods are usually better than store-bought ones for several reasons among which are discussed here. Babies do not have to be limited to eating pap alone, babies like all humans love variety. Sometimes offering a baby a baby-friendly version of what the grown-ups are eating is good. It saves one the stress of preparing an entirely different food for the baby and also introduces the baby's palate to staple foods in the family. Rice is a staple food in Nigeria. Most homes eat a rice-based meal at least once a week. Some store-bought baby cereals are also rice-based. Rice is actually not a great food for babies because of it's low content of nutrients needed by babies. Like all such foods, rice can be supplemented with other foods to create a nutrient balance of sorts. The rice described in this article is supplemented with nutrient-dense vegetables. Boil the white rice just the way you do for the entire family but do not add salt. Pediatricians discourage the addition of salt to foods meant for babies below a year old. Thoroughly wash and steam the vegetables (either using a steamer or spreading over your hot, cooked rice for about 2-5 minutes depending on the type of vegetable). 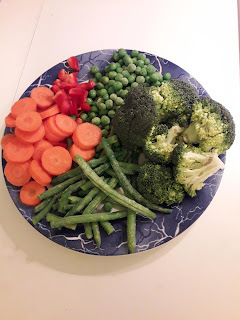 Some vegetables take slightly longer to soften, example carrots and broccoli. 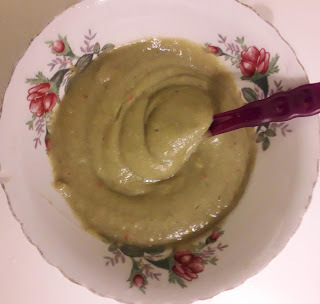 Scoop the softened vegetables and a little rice into your blender or food processor and mash. 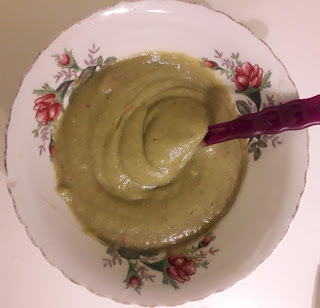 Or use whatever method of mashing baby food you use. The aim is to achieve a consistency suitable for your baby's age and preference. Older babies can handle not-so smooth consistencies. Your baby food is ready. The major difference between this food and a regular vegetable puree is the inclusion of rice. 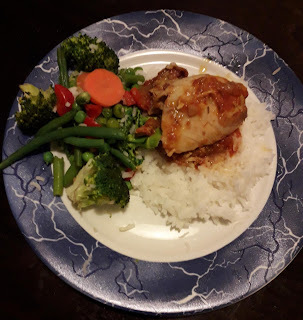 N.B: Stew was not added to the baby's version as the stew contained salt and some seasonings believed not to be very suitable for babies. Feel free to add a little stew to yours if your baby is at least 10 months old and/or your stew contains nothing you think the baby cannot handle. 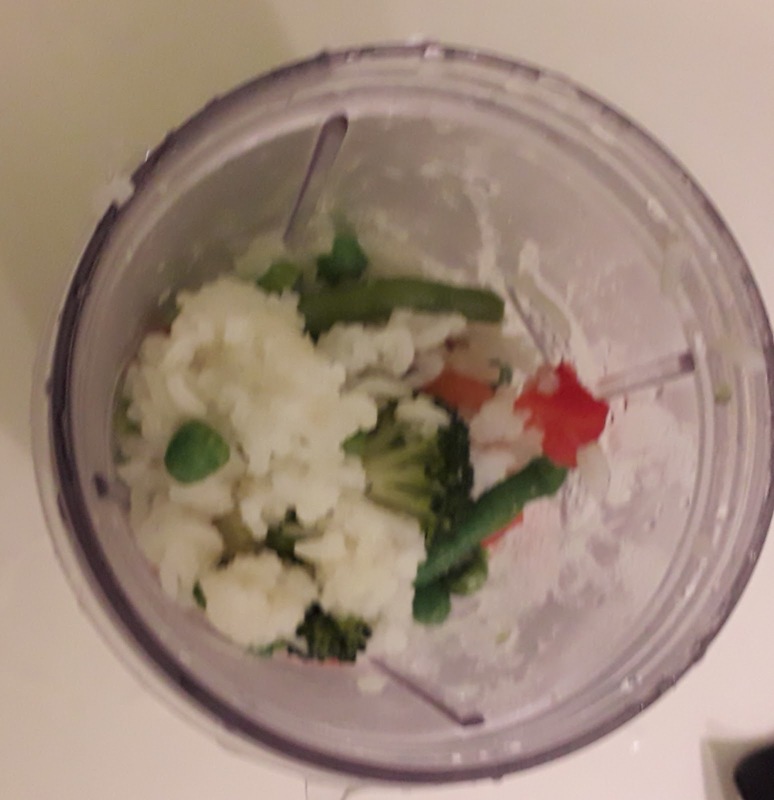 Mashed rice and veggies. Notice the not-so smooth consistency?